On 13th November HIIC tutors, participants and delegates came together for the launch of the updated HIIC Youth Pack. A Pack that has been specifically tailored to be used with young people in schools and community settings. This HIIC course enables people to develop their understanding of the range of factors that affect their health and the health of their communities and to explore how these factors can be addressed using community development approaches. Off to a great start, we heard from a HIIC group from Douglas who’ve been working through the accredited course over the last year. Meeting at Douglas Community Centre, the five women, aged from 17 to 65, have completed part 1 of the course. Using their experiences, the women delivered a group presentation on an issue close to their hearts: self-harm and suicide. The play, ‘She Died Waiting’, depicts the story of a young woman who self-harms. This powerful piece of drama, written and performed by the group, has been highlighted locally as a fantastic piece of community learning, with the group using the skills and experiences to demonstrate how health encompasses a range of different factors. You can read more here. At the event the women spoke passionately about their experience, individually and as a group. With each woman agreeing that the course has brought them a new sense of confidence as well as opening many doors to new opportunities including further education at degree level and their first ever paid job in care. “Feeling we can have a positive impact on the outcomes for people experiencing poor mental health and as a group experiencing a real sense of achievement performing our play for different audiences”. Everyone in the room was extremely impressed with the HIIC group and couldn’t wait to dive deeper into the principles of the course. This was perfect timing as we welcomed Ann Duffy, main lead on the development of the Youth pack. "The core underpinning theme of HIIC is community development. It places value on supporting individuals to work collectively on extending participatory democracy & on social justice & equity." She also spoke about how the Youth Pack enabled young people to be "creators rather than passive consumers of services". “Seeing young people take forward what they are passionate about is just amazing”. “I thought it was brilliant, I was interested in every bit of it. I learnt that society see effective contributors as the paid work force and we as young parents want to be valued and show the communities that we live in that we too can be effectivecontributors. But one very important lesson that we have learnt from HIIC is that this a stereotypical view, that society is created; and regardless of age we need to change and recognise that an effective contributor comes in many forms and success is not measured by how much you earn or by what car you drive but about embracing your life goals and valuing success with your own personal achievement”. An amazing input from the Castlemilk Young Parents Group, which from the evaluation feedback, the delegates loved their enthusiasm and positivity when talking about HIIC. From this event we wanted to inform and educate our delegates about the HIIC youth pack. 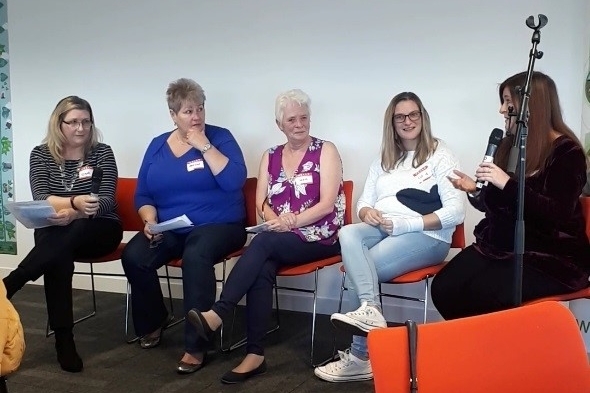 We allowed discussions to flow throughout the day, to give people a chance to ask questions, hear from lived examples and to think about how they could use HIIC in their community. It was amazing to hear the stories of how people have used HIIC as a tool to develop their skills and local communities. Some fantastic feedback from the day! “THIS LAUNCH HAS ENERGISED ME! THANK YOU”. “Looking forward to taking HIIC forward into the future and involving youth in my area”. “Whole morning was interesting and informative. Am grateful to everyone for sharing thoughts and experiences. Thank you”. We'd like to thanks everyone who contributed on the day! Learn more about HIIC here.